Hermes is currently testing a Danish-made TRIPL vehicle to deliver parcels in the city of Göttingen. The electric three-wheeler is being used to deliver in the inner city area where there are restrictions on the use of conventional vehicles. Plans are also afoot to deploy TRIPL in other cities. 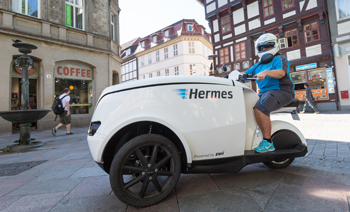 Hermes Germany is currently running tests on an innovative electric vehicle to deliver parcels in Göttingen. 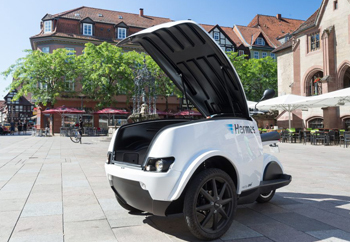 The home delivery specialist is using the Danish TRIPL electrical three-wheeler to deliver to customers' homes in the inner-city area with access restrictions for conventional vehicles. The test runs underscore Hermes Germany's commitment to climate and environmental targets, delivering emission-free by 2025 in downtown areas of all key German cities. In collaboration with Danish car-maker EWII, Hermes Germany has been testing parcel deliveries using the TRIPL since the beginning of May 2017. The unique zero-emission, urban cargo e-vehicle is being trialled in the university town of Göttingen. "We are using the TRIPL to deliver small parcels and tote bags to homes in the inner city area of Göttingen. The vehicle is highly interesting for us not only because it is so easy to park, but it is also extremely maneuverable and has a relatively good range. On top of this, we can use the TRIPL for roads and paths that are inaccessible for conventional means of transport. This not only speeds up, but also simplifies home deliveries – especially in the old part of town," says Dennis Isern, last mile manager at Hermes Germany. The test is scheduled to end at the end of August 2017. With a trunk capacity of 750 liters, the TRIPL can transport up to 60 parcels. A range of up to 90 miles (140km) between charges, the TRIPL will get you through two days of deliveries in a town like Göttingen. And there are more benefits. The electric vehicle can be charged from standards sockets: no need for any special charge points. "As an environmentally-friendly university town, Göttingen is highly suitable for such extensive tests of alternative delivery concepts especially because conventional vehicles only have access to the city center area in certain time periods. This makes the use of alternative vehicle systems such as e-scooters or bicycles more attractive in the future, providing environmentally-friendly, customer-centric solutions," says Dennis Isern. Across Germany, Hermes is trying out alternative delivery concepts, primarily with inner-city deliveries. As part of its strategic partnership with Mercedes-Benz vans 1,500 Mercedes-Benz electric transporters will be deployed successively from 2018. By 2025, the target is to ensure that parcel deliveries to inner-city areas of all major German cities will be CO2-neutral. And there are other projects, such as in Hamburg where six transporters from e-mobility specialists emovum are operating in the downtown area. Since spring 2016, Hermes has been testing an electrically-run 6-ton vehicle in its operations in Stuttgart. Hermes Germany's most southern logistics center officially commenced operations in the Bavarian town of Graben. Hermes app recognizes parcel sizes using smartphone camera – thanks to augmented reality (AR). Singles' Day, the world's largest online shopping event, took place in China on 11 November. 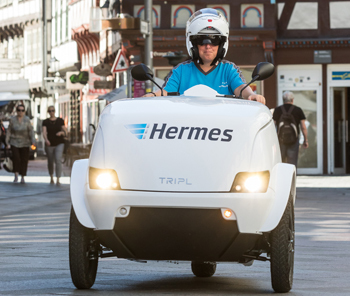 Hermes is currently testing a Danish-made TRIPL vehicle to deliver parcels in the city of Göttingen.